Based on interviews with numerous students (most of whom did not want to be named) there are rifts between the ANC-aligned South African Students Congress (SASCO) and the other student movements. There is also a rift between students who wish to write exams, and students who wish to pursue a national shutdown of tertiary institutions until demands on fees and outsourcing have been met. Here are reports of Monday's events at Wits in Johannesburg, UCT and UWC in Cape Town, and the East London campuses of Walter Sisulu and Fort Hare. The university's senate meeting was suspended this afternoon as campus remained closed on Monday, with students continuing to protest until their demands have been met. Vice Chancellor Adam Habib has met with students in a packed Senate House, dubbed Solomon Mahlangu House, to discuss a way forward after last week's protests saw government agree to freeze fee increments in 2016. He said that the school programme needed to resume tomorrow, but exams had now been postponed indefinitely. Habib put forward a nine point plan to address the demands to end outsourcing and fee increments as well as discuss the long term goal of free education. A general assembly expected for tomorrow will propose the plan for exam schedules and the rest of the academic year. Although President Zuma's announcement to cease fee increases for next year was seen as a victory, many student leaders said that this was not enough. Habib confirmed there would be no increase in fees for tuition or residence in 2016. He said the university would also commit itself to drawing up a workers’ charter and establishing an internal commission to investigate the effects of outsourcing, costs of ‘insourcing’ and alternatives. He said Wits would also undertake to find the financial resources to support the children of outsourced workers provided they qualified for admission. According to Goldman Sachs, the South African economy has tripled in size since 1994, but 85% of black South Africans remain in low income brackets. Meanwhile 87% of white South Africans enjoy middle to upper-class status. 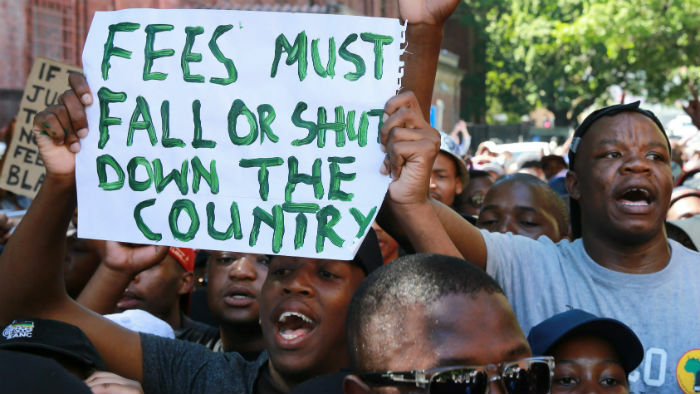 Economically, South African universities are facing serious problems. The cost of infrastructure and utilities is rising, while public funding is falling. At the same time, the value of the rand against the dollar has fallen by 22%. Habib said there would be no disciplinary measures taken against students who were involved in legitimate forms of protest and that the university would agree to make an effort to resolve any outstanding issues which students wanted to address in good faith. Should the students agree to these measures, the university will call a General Assembly. At the time of publishing, students were still discussing the matter. Students at Wits appeared divided. GroundUp spoke to several students who did not wish to be identified. They said they wanted to write their exams while continuing the struggle. They complained that they were being intimidated. In support of their claim that they hold a majority view, students opposed to shutting down the university pointed to a petition online started by Saieshan Vandayar for exams to continue. The petition has over 4,200 signatories at the time of publication, though GroundUp is not in a position to confirm how many of the signatories are Wits students. "It seems like today is all about political agendas," said accounting student Solly Masenya. "It's dragging on too much. We had a great victory last week but now we have to start thinking about graduating." On the other hand, biology student Amy Josephine said, "If we stand together we can show government and management that they can't neglect us. We've got to remain as a collective." A student organiser GroundUp spoke to said that there was an attempt by SASCO, on behalf of the ANC, to demobilise the student protests. Meanwhile, the university's SRC is using Whatsapp and social media to arrange study and tutoring sessions in the evenings this week. Students, lecturers and professionals have volunteered to help out. Campuses at the University of Pretoria and Tshwane University of Technology were also closed on Monday as protesting students met with university management to discuss their demands. Protests continued at the University of the Western Cape. Despite its official announcement earlier that it was open, UWC is now closed. A senior staff member said there was evidence of intimidation of students by other students. Students marched from UWC's private residence, Kovacs, to various faculties, attempting to shut down the campus. A final year political science student said that most students are on National Student Financial Aid Scheme (NSFAS) loans and that these needed to be paid back once a student graduated. She said that once a student graduates, interest starts to accumulate, even if you are unemployed. 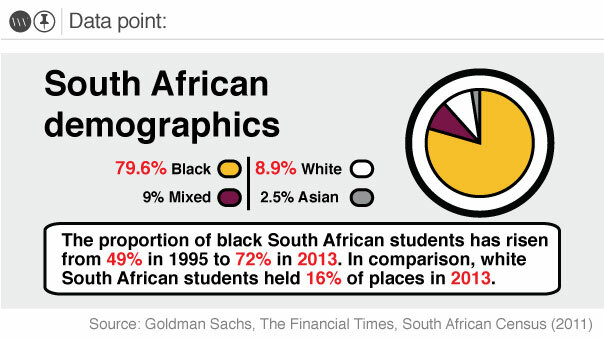 In 2001, one out of 17 South Africans was a university graduate. By 2030, it is projected one out of six South Africans will be a university graduate - a 300% increase. Students were joined by academics supporting the students’ call for free education. Kamve Rubulana, a student leader, said that they were "eternally grateful" to the academics for supporting them. "You, as parents, as academics, as intellectuals have seen that it is a just cause," Rubulana told the academics. Dr Efua Prah, a lecturer in the Department of Sociology and Anthropology, said that the staff wanted to present a unified voice to strengthen the demands of students. "We are with you, not against you," she said. Prah said that the staff supported the move towards free education. 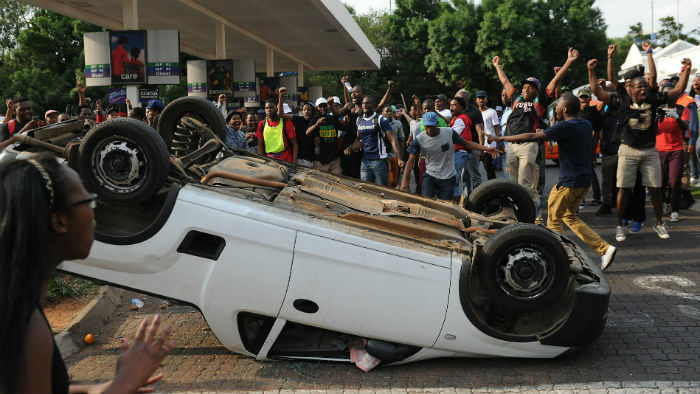 Student Mihlali Mtoto said that the movement had so far been peaceful. He said that when students wore cloth covering their faces, it was from fear of victimisation for participating. "We want a university assembly so that the rector can sit down and listen to us," said Mtoto. He said that the police were violent. "We are students, not criminals. We do not want to die; all we want is an education." At the end of the march, the students decided to occupy the Life Sciences Building. The march occurred on Monday despite of a statement by the SRC that discouraged further protest action. Apart from the issue of university fees, another pressing concern for many students is the high cost of living in Kovacs – in the region of R40,000 per year depending on the room and when payment is made. Students living in Kovacs said that they wanted it to be managed by the university. There are plans for a general assembly tomorrow with students, staff and the rector. The University of Cape Town (UCT) Hiddingh Hall campus was closed, with a small group of students at the entrance standing with posters, one of which read: 'No to police brutality'. This afternoon, roughly 300 UCT students and workers gathered at Avenue House (dubbed Azania House by the students) in Mowbray to discuss how they plan to keep the university shut down until management meets their demands regarding outsourcing. Out of 235 professors, UCT has just eight black African professors on its staff. "Students, don't forget. When you had your struggle, we supported it. Please help us in ours. We need numbers. The students and workers have to work together," said a man who works at UCT. Discussions about whether medical students will be able to write their final exams this week arose near the end of the meeting. A sixth year medical student raised the concern about the need for medics to complete their studies in order to report for community service duties commencing on 1 January 2016. She made the point that the medical students, including doctors, occupational therapists, physiotherapists and dieticians, are needed to tend to the majority of South Africans who form part of the working class. "This is the same group that the outsourcing must fall movement is trying to help," said the medical student. "Where should we draw the line about what is essential and what is not essential? We could be asking the question why don't the social workers write? Or why don't the lawyers who lobby for the rights of the workers write? Why should we privilege one sector over another?" asked a man in the crowd. A student, whose response received loud applause, said, "This question should not be targeted at us, the people at the grassroots level. It only results in division amongst us. We don't have the power to respond to this. You need to target this question at management and those in higher places." Another student said, "I think this issue can be the Trojan horse in our protest." A burnt out car was found on Avenue Road during the night. It appeared to have been petrol bombed. Speculation about who was responsible and who the car belonged to circulated on social media, but GroundUp has been unable to confirm any further details. In the early afternoon about 50 Walter Sisulu University students marched on a residence of Fort Hare University in the East London city centre, calling on the Fort Hare students to join them. GroundUp's reporter witnessed students kick down doors and use fire extinguishers to spray water under doors. Some students opened their doors still wearing their night clothes. Some refused to join the protest. Three students who did not want to give their names told GroundUp that they saw no point in continuing the protest since President Jacob Zuma had announced that fees would not go up next year. But as others joined the Walter Sisulu students the group swelled to about 500. They marched to the Fort Hare East London campus calling for free education and the scrapping of all student debt. Student leader Malakhiwe Mbambo addressed the crowd calling for debt to be scrapped. "This is a battle we must win this year," he said, noting that some of the students were in their final year. One former student who did not want to be named said he owed Walter Sisulu University R30,000, and he hoped the fight would go on until debts were cleared. After the address the students returned to Walter Sisulu campus. Both East London campuses (Fort Hare and Walter Sisulu) are closed. According to Mbambo, exams which were meant to start on Monday have been postponed.